Thinking with your hands: A visit to the Tinkering Studio in San Francisco, USA. This post features a reflection on my visit to the Tinkering Studio at The Exploratorium in San Francisco, USA with a focus upon what art galleries can learn from the Studio’s approach to constructing immersive creative environments for children based on experiential learning and play. In August 2015 I participated in a ScratchJr/Light Play prototyping session between the MIT Media Lab’s Lifelong Kindergarten group and the Tinkering Studio team at The Exploratorium. 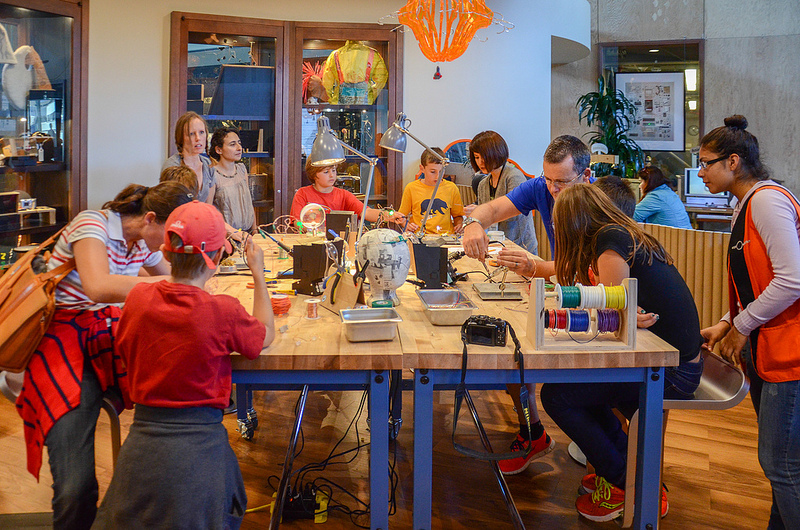 The Tinkering Studio, which opened in 2008, is a research and design laboratory housed inside the Exploratorium, a museum devoted to the intersection of art, science and technology. The Studio is an “immersive, active, creative place”  for experimentation, investigation, making and hands-on play for all ages. Scientists, artists, programmers and academics frequently take up residence in the studio, working alongside the Tinkering Studio team to create new installations, run programmes and run public forums. I have closely followed the progression of the Tinkering Studio’s programme for a number of years with much admiration. When the opportunity arose to spend an extended period of time in San Francisco, I was eager to connect with the team. I was particularly interested in learning about two key components of their programme: firstly how an interdisciplinary development team (or ‘communities of practice’) of artists, educators, scientists, programmers, designers and makers, work collaboratively to develop, prototype and construct their creative projects. These projects usually start with a provocation, question or concept that goes through continuous exploration and collaborative development. For example, during the session I participated in, the team were investigating how the Light Play project could be connected with ScratchJr to make usable programmable elements for young children aged 5-7 years. Tinkering activities are not just about putting some art and technology materials on a table and letting kids go nuts, it is ‘highly choreographed, sometimes painstaking, deeply discussed, and a well thought-out discipline, so that we actually can facilitate peoples’ thinking through initial starting points that might lead to complex new directions.’  Secondly, I was interested in how the team observe, reflect and makes changes to these immersive, creative spaces over time in response to new ideas, new audiences and new contexts in which they are presented. 1) The need for quality social support by educators within the space whose role is to guide and challenge participant’s learning (NB: not direct it). These educators need to be responsive to changing practices in children’s learning and curiosities and make modifications to materials and the arrangement of the space as a result of this. 2) The need to find a balance between the presentation of open-ended materials and structure within the activities. This balance is continuously changing depending upon participants and the context in which they are being presented. Educators and designers need to be aware and responsive to this. 3) The use of open source information sharing. The Tinkering Studio’s team have a frequently updated blog which documents the prototyping, exploration of ideas, new initiatives, successes and failures of projects. The blog is not used as an extended marketing tool (let’s be honest, this is how most art galleries use them) but as a vesicle for generating critical collaborative dialogue and disseminating discoveries, learning, new partnerships in an immediate and direct way to an international network of makers, programmers, educators, artists and practitioners. These ideas and projects are also shared through publications, public events, Coursera courses and professional development sessions for teachers and museum professionals. Through this, the practice of tinkering is able to become more dialogic, inclusive and internationally widespread. The Exploratorium is also a part of a new international PlayFutures network established to create a global community committed to the explanation of opportunities for young children’s learning through play. The learning processes explored through tinkering are not just connected to the artistic process. It is the creative process used by artists to explore understandings of the world through experimentation, discovery-based play and expression of these complexities through making. Through my PhD action-research project and work as a children’s curator I hope to bring these aspects more fully into my own practice through developing a collaborative and sustainable dialogic framework between artists, curators, young children and their parents that can be used to construct immersive early years environments in art galleries. In a city that so strongly values creative innovation, risk taking and original thinking, it seems fitting that it is also home to a place that is championing people’s need to direct their own learning through creative play. Petrich, M & Wilkinson, K 2015. ‘What do we want? More replicants or a next generation of students who can think for themselves?’ The LEGO Foundation website, viewed April 10, 2016. Flannery, L., Silverman, B., Kazakoff, E., Bers, M., Bont, P. & Resnik, M. (2013) Designing ScratchJr: support for early childhood learning through computer programming. Paper presented at the Proceeding of the 12th International Conference on Interaction Design and Children, New York, USA. Petrich, M & Wilkinson, K 2014. The Art of Tinkering: Meet 150 Makers Working at the Intersection of Art, Science & Technology, Weldon Owen, Incorporated.